Read the latest brand news from Visit Sarasota County. How time flies! The 2019 Spring Training games have come to an end, but hopefully our impression on visitors carries on. 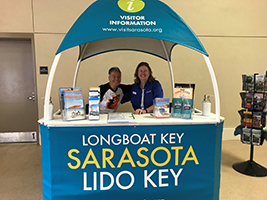 It was another great year for our visitor services staff at Ed Smith Stadium, welcoming nearly 2,200 visitors to the Visit Sarasota County kiosk during Orioles home games. We have an amazing, dedicated group of volunteers who are passionate about Sarasota County and its tourism-related offerings. We look forward to next year, where we will be represented at two major league stadiums: the Baltimore Orioles and Atlanta Braves! In conjunction with the opening of CoolToday Park, VSC hosted a group of media from Atlanta, and then also attended the Braves “Sarasota Day” game. Nearly 15 journalists – none of which had ever been to the area before – were pleasantly surprised by the good stories of Sarasota County, including our arts, culture, nature, dining, sports and events. Many articles have been published already, and we expect quite a few more to come. See below for a sample of the coverage. Also, in March, our Communications & Content Manager, Britney, attended Travel Media Meetup. There she met with more than 25 travel writers, bloggers and influencers and pitched Sarasota County. As a result, there has already been a Twitter Chat centered on Sarasota County, which boasted reach of more than 226,000 and 500 total tweets. announcements so you can chime in! We are also excited to be hosting 2 writers we met there to promote Savor Sarasota Restaurant Week in June, which will impact local businesses during a non-peak month. Co-ops, photoshoots and visitor guides, oh my! Advertising efforts are in full swing and we have the gears turning on several projects. Our new advertising photoshoot is underway with a special focus on one of our big Brand team goals: diversity and inclusiveness. 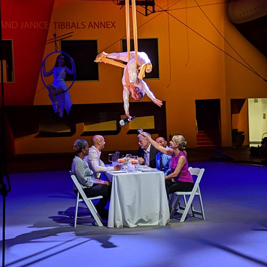 Shooting locations include the newly-renovated arena at the Circus Arts Conservatory, Bayfront Park, Oscar Scherer State Park and Manasota Beach. Remember, our brand is your brand too, and you can always view and request VSC-owned pictures and other content for free from our library here. combined the circus with business meetings. Visit Sarasota County advertisements for March will be hitting newspapers, magazines and digital publications in markets like Indianapolis, Minneapolis, Detroit, Columbus and more. Savor Sarasota planning is underway, and several ideas are floating around for free content marketing opportunities on our website and social media. Thank you everyone who signed up and got the ball rolling with pictures and chef biographies, but we want to take some of your stories a little deeper. Tell your marketing branch to keep an eye out for opportunities to pitch and participate in content to promote this wonderful annual event in June. to meet baseball fans and answer travel questions. You’re never too far from our expert visitor services staff and volunteers this time of year! Check out our kiosk at Ed Smith stadium and say hello to the friendly faces working hard every Orioles’ home game to represent our tourism industry. They assist thousands of fans and visitors looking for things to see and do in our destination, interacting with about 125 people every game! 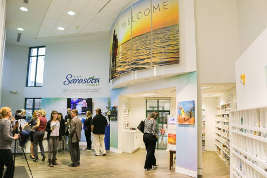 Visit Sarasota County just opened ANOTHER visitor center; this time inside the Venice Area Chamber of Commerce! Meet our new part-time visitor services employee and volunteers who will be helping curious travelers find their way to your businesses in south Sarasota County. We are excited about this partnership and are happy to reach more visitors staying in the southern parts of our destination. Stay tuned in the coming months for an invitation to our grand opening to celebrate our Venice visitor center! With spring comes the end of “season” and pre-planning for summer adventures. 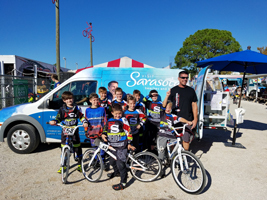 We hosted a variety of eco- and family-friendly writers to help encourage off-season visits to Sarasota County’s beaches, activities, attractions and current events. kid-friendly options like Mote Marine. AJ Williams saw Sarasota both on land and on sea. We also continued to spread Sarasota County’s stories internationally by working with VISIT FLORIDA to host a German Influencer, Jessica Henze, in partnership with the German toy company, Steiff. on her tour of Florida. Pandora and Storygize were selected to promote several events that received grants. 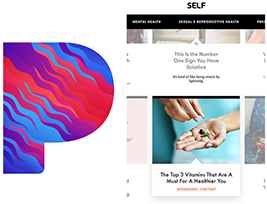 The result of our Red Tide Relief Marketing Grants will start rolling out this month on Pandora and Storygize. From spring holiday celebrations to food festivals, we are readily spreading the word about your unique projects! We are in the process of planning and scheduling another photoshoot for new advertising images. 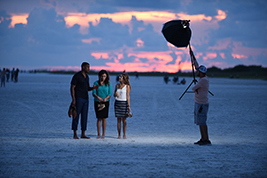 It’s early, but we hope these professional images will help us market our meetings, leisure, diversity and nature offerings throughout Sarasota County. Expect to see some new images representing all there is to see and do in our area soon! In March, we are finishing up a robust three-month broadcast campaign in Indianapolis, Ind., Minneapolis, Minn., and Detroit, Mich., totaling more than a thousand spots. 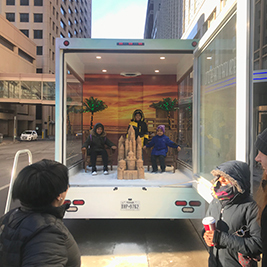 These ads ran in conjunction with our Glass Box Truck and billboards which toured the streets of multiple cities including these three in January and February. By using several mediums, we are able to penetrate the markets more effectively and maximize our efforts. Also, it probably doesn’t hurt to see our beautiful, warm beaches in markets dealing with freezing weather and snow! 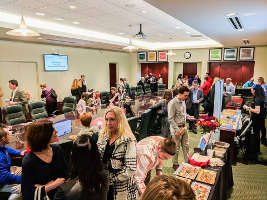 Visit Sarasota County recently updated our calendar system, and we need your events! The event page has a "Submit an Event to Our Calendar" button, which leads to a form where anyone can add events to our calendar. If the event is one in which tourists and other visitors can participate and enjoy, we will likely approve that event content. Our mission is to always have a platform that reflects the best (and most up to date) happenings in Sarasota, so please help us help you and get your events on our calendar! If you have any questions about using our new events calendar program, don’t hesitate to contact our Website Supervisor Matt Murphy at [email protected]. The Grand Opening of our Downtown Visitor Center held on Jan. 29 was a huge success! Around 200 people came to view our beautiful downtown center and explored the newly-renovated chamber offices. Refreshments and food were offered by several of our partners. 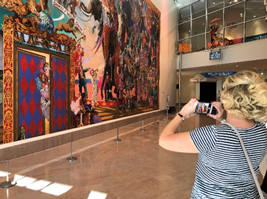 Even though the center opened in October 2017, the new location has added several new features and is finally a great place for our visitors and locals to enjoy – and experience world-class augmented reality! Visitor Services is also excited to share that Q1 visitation is up 220% compared to Q1 of the previous fiscal year. Face-to-face interactions have spiked in large part due to the growth of SRQ Airport new non-stop flights. More people are visiting our joint welcome center at baggage claim in the airport in addition to the new downtown visitor center and the Visitor Information Vehicle (VIV) outreach in the community continues to grow. These numbers will only rise once the new VSC visitor center in the Venice Chamber of Commerce officially opens in February with an additional part-timer staff person and volunteers. about SRQ far and wide! The Public Relations team has coordinated with nearly 10 travel writers this month to curate stories about Sarasota County’s beaches, attractions, culture and current events. We’ve also been leveraging these opportunities to spread the word about the new flights to SRQ! OPL Properties hosted Passport Mommy, who interviewed our PR Manager, Britney Guertin about Sarasota County. VSC went on-air again with Michael Patrick Shiels, who’s “Big Show” syndicates to eight Michigan radio stations. 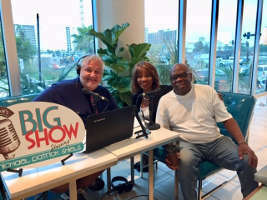 Michael broadcasted live from Embassy Suites for three days and interviewed Vickie Oldham and Walter Gilbert about the Newtown Alive’s recently-announced U.S. Civil Rights Trail designation. Check out recent coverage and stories about our community below. Sarasota County earned a spot on several lists recently, including two honeymoon mentions! The team is working on compiling the advertising plans for the recipients of our Red Tide Relief Marketing Grants! Stand by for more upcoming events and programs helping generate more tourism to Sarasota county. We have also been reviewing numerous print and digital placements, many of which are co-ops from partners, allowing us to maximize our combined budgets. Keep an eye out in February for VSC in the following publications: Outdoor Photographer “Nature Lover’s Guide to FL,” Chicago Magazine, Florida Trend, plus our numerous digital platforms: Hulu, Google, Bing and Trip Advisor. Reminder! Please join us on Tuesday, January 29 between 4 and 6 p.m. at the downtown Visitor Center official grand opening. No RSVP required. Refreshments and light bites will be available. We look forward seeing you there! Additional parking available at the parking lot on the southwest corner of Osprey Avenue and 2nd Street. 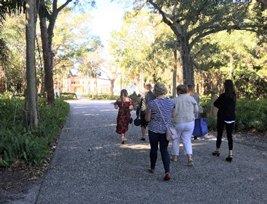 Communications & Content Manager Britney Guertin attended “Florida Huddle’s Media Marketplace” where she met with nearly 20 travel writers and media outlets, each eager to learn more about what Sarasota County has to offer. Media reps with USA Today, Canadian Traveler and Samantha Brown’s Places to Love were a few in attendance. VSC’s Glass Box Truck Hits the Road! 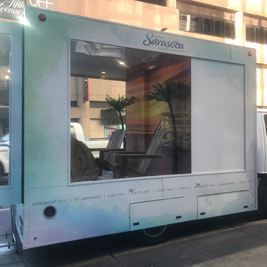 VSC’s out-of-home activation using a glass box truck is underway through February. 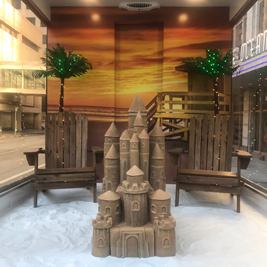 This eye-catching beach scene is visiting six cities in six weekends: Minneapolis, Chicago, Indianapolis, Columbus (Ohio), Cleveland, and Detroit. 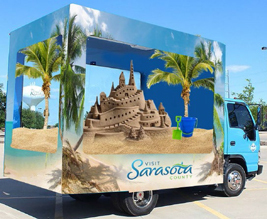 Curious locals can step inside to lounge on Sarasota’s beach or they can engage in a “Florida-style” challenge where they then become eligible to win a free trip to Sarasota County! 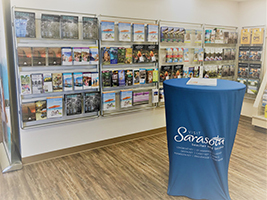 On January 29, 2019, we are hosting an official Grand Opening/Open House of the downtown visitor center inside the Greater Sarasota Chamber of Commerce building at 1945 Fruitville Rd, Sarasota, FL 34236. Please join us for a fun time that day between 4-6 p.m. with your fellow VSC partners, board members from both VSC and the Chamber, local dignitaries and media. Since opening the new visitor center last year we have completed some awesome renovations and redesigns, so we look forward seeing you there and show you how we promote this beautiful county and your businesses. An official e-vite will be emailed soon with additional information. 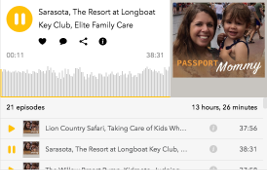 The advertising plan is underway with digital placements on Trip Advisor and a retargeting campaign towards visitors to the Visit Florida website. We also launched print ads in D Magazine out of Dallas in support of the new America Airlines Service into SRQ ,and a placement in Cleveland Scene, encouraging travel to the warm, sugar-sand beaches of Sarasota while Ohio is covered in icy cold snow. We are ramping up to take our warm weather message across the frozen North with fully integrated campaigns set to go live in Minneapolis, Detroit, Cleveland, Columbus, Indianapolis and Chicago. 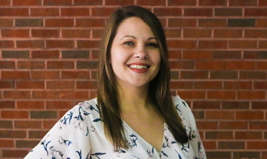 Visit Sarasota County has appointed Britney Guertin Communications & Content Manager! In her role with VSC, Guertin will manage all domestic and international PR initiatives, including press relations, visitor information, partner and stakeholder communications and event and campaign promotions. 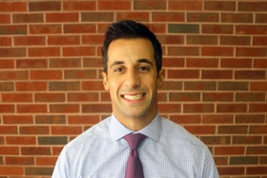 Guertin most recently worked as the PR & Social Media Director with Grapevine Communications. She is the incoming Chair with the Lakewood Ranch Business Alliance’s Young Leaders Alliance and the current VP with Designing Daughters of Sarasota. The Turkish Radio and Television Corporation (TRT World) visited last month to film a news documentary about Amish culture in America. What better stop than Der Dutchman and Yoder’s Restaurant & Amish Village? Both partners were very accommodating for the weekend video shoots. Stay tuned to see the final product! 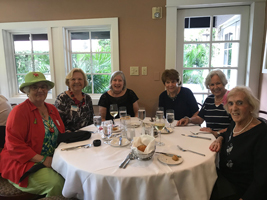 Every year, we invite our dedicated volunteers to an appreciation luncheon to thank them for their continued support and time spent helping our visitors. Last year, our Visitor Services team had over 30,000 face-to-face interactions, informing people from all over the world on all there is to see and do in our beautiful area. We are still looking for giveaways to add into their gift basket so if you have anything you would like to add something, kindly contact Sandrina McCloud at [email protected]. The 40 volunteers and part-time staff at our visitors centers are your biggest ambassadors, so let’s show them how much we care about their hard work! …And countless more! Thank you John and Mark for the hard work! 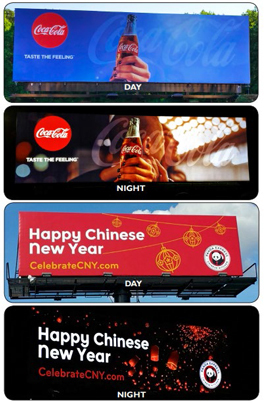 The advertising department has been busy planning out-of-home advertising opportunities for the coming quarter. 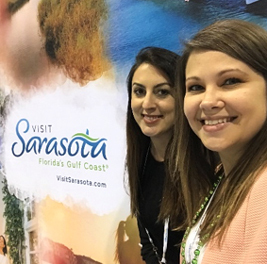 Throughout January, February and March, we will utilize a fully immersive, multi-touchpoint campaign that highlights the unique attributes of Sarasota County in a memorable way! 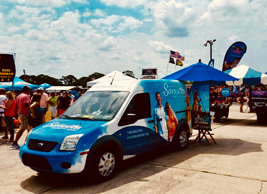 A Sarasota County branded mobile glass truck tour will make a major splash with multiple stops across our desired opportune markets of Minneapolis, Indianapolis, Columbus, Cleveland, Detroit and Chicago. Supplemental messages across these same markets will be featured through Day to Night Backlit, and Growing Landscape billboards. 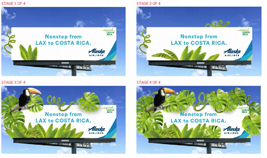 These changing billboards will attract attention and help maintain interest in a very creative way. We are also working on a TV broadcast schedule, print advertising and digital campaigns to go along with these out-of-home efforts. Coupling the warm beach atmosphere of Sarasota County with the chilly weather seen by these cities during this time period, we hope to capitalize on people’s longing for warmer climates. We still have some co-op advertising available in these markets. Reach out to Seana Mincy at [email protected] to learn more about co-op. 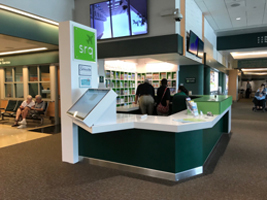 The new visitor center in the Sarasota-Bradenton International Airport (SRQ) is performing well in its first three months. Since opening on July 1, our volunteers have interacted with about 4,000 people at the kiosk located in the baggage claim area of SRQ. Volunteers from VSC and SRQ are present at the airport from 10 am to 4 pm every day. The closing numbers from the past fiscal year show several improvements for visitor services. 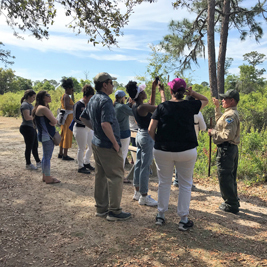 In 2018, VSC organized 20 familiarization tours for our volunteers, providing education on over 35 tourism industry organizations in our county, helping better serve the needs of our visitors. The creation and distribution of bags for our visitors (leisure and business groups, weddings, family reunions, etc.) nearly doubled in the past year as well, from 3,658 bags to over 5,200 between 2017 and 2018, a 43% increase! The VSC website accounted for over 64,000 referrals to partner websites during the fourth quarter of this past fiscal year. 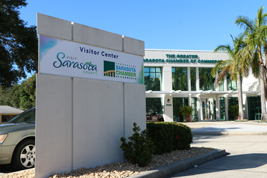 The number of visits to VisitSarasota.org visits were up 60 percent, unique visitors were up 56 percent, and pageviews were up 74 percent! Also, since creating a signup tool for the website homepage that asks first time visitors to the site to subscribe to our consumer e-newsletter, our subscriber base increased by 512 percent.